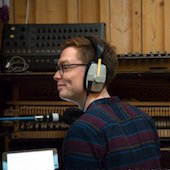 Chris Roe is an award-winning composer and multi-instrumentalist based in London, working on a myriad of films across all genres. His music is “brilliantly unnerving” and “highly energetic”. 2017 has been really busy for Chris and projects include: Crime/thriller/horror feature Charismata to be released later in 2017; BBC2’s Is It Safe To Be Gay In The UK?, part of the Gay Britannia series; a doc on Children of the Snowland a feature doc about the plight of Nepal’s children; Murder In Italy:Unknown Male #1, 4×45-min drama-doc series for BBC / Sky Italy. It’s based on the fascinating true story of the shocking death of a young girl in Italy and the subsequent search for her murderer – directed by Hugo Berkeley for Amber Entertainment (Lawrence Elman). He delivers a doc on the legendary Spitfire plane in 2018. Other projects include Mission Control, a feature documentary with a full orchestral score about NASA and the team who put a man on the moon; Death of a Gentleman, another feature documentary about corruption in the world of cricket and winner of ‘Best Documentary’ at the Sports Journalism Awards; Neverland, a short drama starring Keeley Hawes and Marcus Brigstocke; and The Milkway, winner of Best Feature at the London Independent Film Festival. Chris was also recently nominated for the prestigious ‘Peer Raben Award’ at Soundtrack Cologne for his score for award-winning animated short The Palace, and was also a prizewinner in the Oticons International Film Music Competition and the Waterloo Festival/BFI Film Score Competition. A diverse musical background as a pianist and string player, as well as training at the Royal College of Music, has lead to a highly-crafted, expressive quality in Chris’ music, ranging from delicate piano/strings writing to explosive orchestral power. Chris also plays in several jazz/funk groups and studied electronic music in Paris. These influences lead to a contemporary, innovative style, and the ability to find a unique sound for each project. Chris is founder and conductor of ANIMA, a group of eight musicians specialising combining live music with film in unusual venues, such as 42 feet below the Thames in the Brunel Tunnel.